The seat in the combine cab is the best seat in the county. Talk about a room with a view! If you operate your own combine, nothing beats the vista before you. Harvest time in the combine provides me the chance to truly enjoy gathering the fruits of my labor. I see rich fall colors, spectacular sunsets, and starlit skies, plenty of deer and an occasional pheasant. During a harvest moon it is fun to shut the combine lights off for a moment and simply appreciate harvest by moonlight. My wife thinks I am weird, but I like to watch the ears of corn feed into the feeder-house and then, with a look out my rear window, I can see the grain fill the tank. Can it get better that that? Of course, sitting in my penthouse isn’t all “Better Homes and Gardens” and “HGTV.” From my perch I also see the weeds that escaped my herbicide program, the stand I got when I planted, the variations that show up from hybrid to hybrid and the beeping and blaring from my monitors telling me to make adjustments. My 20/20YieldSense monitor shows instant yield averages right before my eyes. 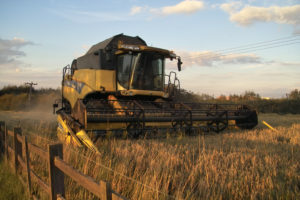 That is of course, IF I calibrated my combine before I began to harvest each crop type. Even so, the information that is being recorded should always be verified by getting off the combine and checking inside and out, confirming that everything is setup and working properly. My soapbox message this month is: Calibrate, Calibrate, Calibrate. You won’t really know what you have got without completing that necessary step. A properly calibrated yield monitor providing reliable data makes analyzing this year’s crop management choices accurate and easier resulting in a worthwhile plan for next year. This data is also a great resource to use when completing your crop insurance production report. If you hire your combining done, don’t let the custom combine driver have all the fun- spend some time in the buddy seat to look for the issues and successes in your fields from that perspective. Analyzing your failures to make sure those mistakes are not repeated is probably the most important objective. Don’t rely on our memory alone, note and record the changes you need to make for next season. Use your smart phone, iPad, notebook, or lunch napkin but write it down! Gathering your information from your fields is the best way to determine your needs. I know how much I appreciate accurate harvest data when working with my grower’s in determining their seed needs. With the right information we can truly place the right seed variety to the right acre and meet the individual needs of our growers. I have to say I agree with Lisa Douglas on her Green Acres farm, “I just adore a penthouse view! “ Don’t you?